About six months ago I got charged like $350 because of a feature I didn’t ask for or want that my checking account had on it. I decided to switch banks because I was mad. I finally paid off my credit card a couple months ago and closed the account. I had paid a little extra on my last payment in case there was going to be any additional interest I’d owe or something. They sent me a check for the $1.85 balance, and yesterday I cashed the check and asked for it entirely in pennies. I ended up getting 150 pennies and a quarter and a dime. 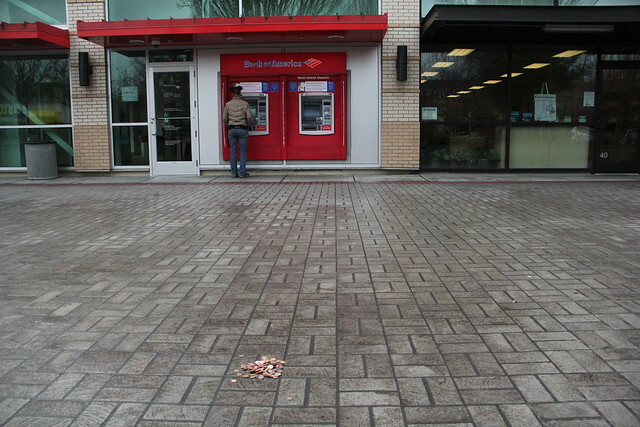 And I left it all in a pile by their atms. I don’t know what this was supposed to mean or if it was supposed to mean anything but it felt good.